Although men’s cocktail attire should be casual in spirit, it generally follows a semi-formal dress code. Men are usually requested to appear in cocktail attire at weddings and official events. The dress code originally dates back to the 1920’s and 30’s when affluent elitists routinely enjoyed a drinking session before dinner (Man of Many). Earlier in history, cocktail attire meant only a formal suit or a tuxedo. But there are several variations and combinations which are popular today. In fact, the attire is not limited to just weddings – men usually prefer to wear a cocktail dress at social engagements or business dinners. For weddings: remember, this is the bride and groom’s day, so leave your pinstripe suit, bright colored ties, and flashy accessories at home – the couple should be the center of attention, not you. Here are a few more things that can help you choose the right cocktail attire for men. Photo by Hardini Lestari on Unsplash. Consider the nature of the occasion, your relationship with the host, and the location of the event. Naturally, nobody would wear a tuxedo to a cocktail party at the beach. Arriving in a pastel suit for a party at a luxury bar is off the table. On the other hand, the best cocktail attire never consists of a t-shirt and jeans or a formal suit with leather shoes. While the summer calls for lighter fabrics and colors, you can go for layering and richer shades in winter. You should also consider whether the event is during the day or evening. In case you’re meeting old friends for drinks at a local restaurant, you can choose casual cocktail attire. However, a major celebration, life event, or a wedding calls for a traditional or contemporary outfit that doesn’t interfere with the mood of the event. Make sure you don’t wear sneakers with any of your cocktail outfits, even if you’re wearing a blazer and a t-shirt. But you can definitely wear nice loafers to make any outfit look great. In fact, loafers are the definitive cocktail event shoe-of-choice. Whether you prefer a suede, penny, or tasseled loafer, these shoes remain the safest choice for all events and locations. Monk strap shoes and leather-soled Oxfords are also acceptable (make sure they’re polished). You can also buy a pair of formal dress shoes if you need to attend a formal cocktail event. It’s okay to wear patterned socks, but they should blend elegantly with your custom trousers and jacket. Wear a dark to mid-gray suit. Your dress shirt should be white, or you can go for a muted color. Do not wear a tuxedo or you’ll look overdressed. Make sure you have a clean shave. Leave the pinstripe suit for the groom if you’re going to a wedding. Avoid wearing any flashy accessories and bright colored ties. Wear a cool blazer with matching trousers or a customized two-piece suit. Look for quality in design and material alike. Consider a slim fit for cocktail socials. Wear an fitting and supporting accessory, like a pocket square or a luxury sport watch. Add your own person touch by mixing and matching patterns and colors. Wear something so flashy that it upsets the host (and the guests). Overdress by wearing a tuxedo and gaudy shoes. Use flashy prints and bold colors. If you’re opting for a suit, it’s possible to experiment with your jacket and trouser combination. Just make sure the items fit you well (more on suiting basics here). Don’t wear baggy pants to a cocktail party, and leave your denim pants for another occasion. When choosing the best belt, go for a classy option. Classic leather belts with a polished brass or silver buckle are great choices. Go for an alligator leather for a step up. You should also leave your tech gadgets at home. There’s no need to wear your Apple Watch when you’re at a cocktail party or event. Unless you live in Silicon Valley, this can make you stand out and attract unwanted attention. If you want to play it safe, choose a custom jacket that’s understated and classy. The formality of an occasion generally sets the right mood for your colors, patterns and accessories. Just don’t go for anything too flashy or attention-grabbing. 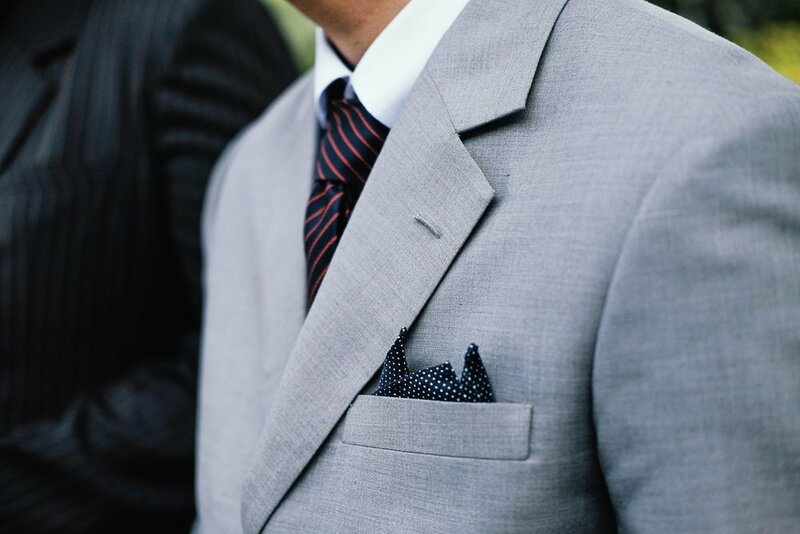 If a dress code suggests you should wear a suit, choose a navy or gray custom suit. Men usually don’t wear separates at cocktail events, but you can mix and match your trousers and jackets to accommodate your signature style. If you’re still unsure, reach out to the host of the party or event. They’ll be more than happy to steer you in the right direction between casual and traditional. The party planner or the host usually specifies clothing rules in advance (like in the invitation). But choosing your own attire is fun when you know how to make the most out of your clothes and create a unique and sleek look.